The Fool Card is the first in a series of mysteries linked to the tarot deck. In this first book, Xana Bard has chosen a quiet life——drinking tea, talking to her pets, reading, and conferring with the Pacific Ocean beyond her picture window. She calls the ocean Doctor P., and it’s cheaper than her therapist and maybe a little more helpful. She’s happy enough, until the night Thorne Ardall, shot while chasing his boss’s killer, crashes into her house. Using her tarot-trained intuition rather than her better judgment, Xana patches Thorne up and they agree to track down the murderer as a team. "So happy to have discovered this author and look forward to reading her other books. Light-hearted mystery with clever phrases and lots of details about the San Francisco Bay Area. Great names of characters and animals." "Easily read over a weekend -- like a visit with good friends to San Francisco. Even though I know the city fairly well, still learned new things about it! Lead characters are like my new best friends. Feel like I share their experiences because the book is written so visually." "Loved the characters. Quick reading and I was anxious to find out "who did it.". Looking forward to reading her other books. Light mystery, but keeps you engrossed and you want to finish the book in one sitting." "Ms. Atkinson's debut novel is a fast-paced romp through the hills of San Francisco starring an engaging heroine, Xana Bard, who modestly attributes her intuition to reading Tarot cards." "Interesting thriller. Hard to put down. Don't know much about tarot but do read lots of mysteries and this is a good one." "Clever, interesting writing. Really held my attention. Loved Xana's character. Can't wait to see what she and Thorne do next!" ★★★★★ Ready for the next card in the deck! "Quick fun read. Engaging. Mystery - action - family drama - what's not to like?! Love the setting in SF. I feel I was along on the ride." 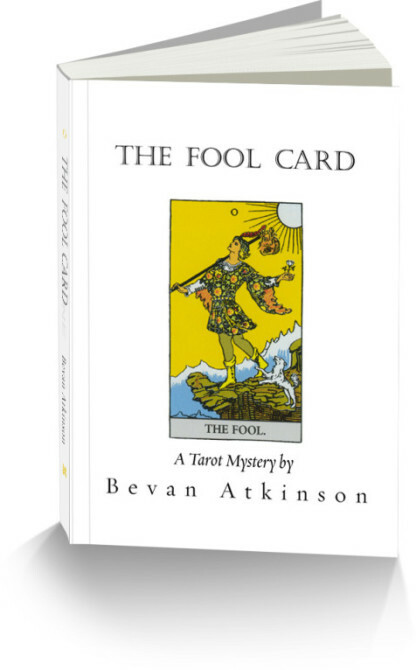 "I'd just read The Fool Card, the lively first book in this Tarot-themed series, and I immediately ordered the second. Too bad The Magician Card won't arrive before Christmas, because I'd love to binge-read straight through the next episode in the exploits of the pun-prone Xana Bard and her oddball partner, Thorne Ardall, a hunk both classy and peculiar. My kind of guy. That Xana's San Francisco home is set atop the San Andreas Fault is emblematic of her vulnerable, intrepid character. So, too, is her affinity for the Tarot's Fool card, a "trickster" who brings "adventure, misadventure, but rarely happiness." Xana's entanglements begin with a literal bang when Thorne (as, in your side?) crashes a Porsche into her precariously placed dwelling while she quietly crushes fragrant herbs into a salver. (Yes, salver. When was the last time you saw that word in print outside of a Christie's catalog?) Xana, her menagerie of knowing cats, Hamlet-like dogs (who "look to her...To bark, or not to bark. "), and the unique ambience of San Francisco, all join to bring this suspense-edged, drolly intelligent murder mystery to its satisfying denouement. Xana's is by no means the most dysfunctional family in the story. This honor goes to the Avery clan, a scheming brood whose knotty intrigues Xana and Thorne must unravel to catch a killer. Then there is Thorne: Xana has a penchant for "rescuing charming basket cases" who walk away once they're re-ambulatory. This history laces their relationship with a sardonic tang, though, you can tell, they totally get each other. The final mood of the tale is wistful. As The Fool card suggests, like Hamlet and her own dogs, Xana must learn that "Readiness is all" and the rest is just a waiting game. And while you're waiting, I highly recommend you spend your time well, as did I, reading The Fool Card."